Andrew Larson is an associate professor of forest ecology at the University of Montana. "We do post fire management to better meet our particular objectives. Not because a forest needs our help, but because we're making a calculated decision to spend money to plant trees, to do whatever, because we're going to get some outcome that we desire," says Larson. Post-burn forest rehabilitation may sound like a lot of tree planting. But Steve Brown with the U.S. Forest Service says planting is a small fraction of what the Service does in the first few years after a fire. "It's a fire-adapted ecosystem that we live in and those processes have have their place on the landscape," says Brown. "They're part of a regenerative process. All is not lost. It's just different," Brown says. 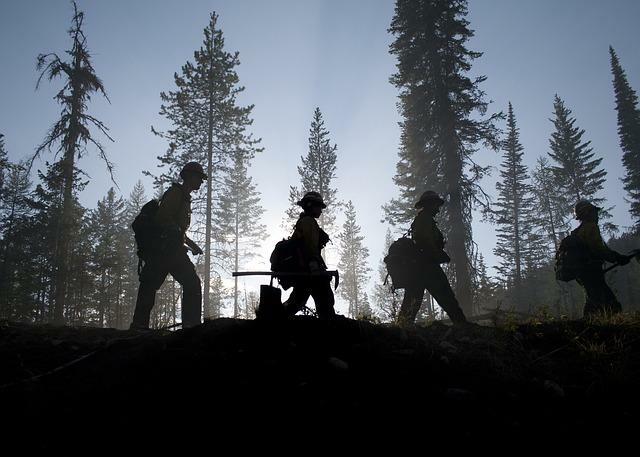 Brown was in charge of post-fire response for the Forest Service in Montana and northern Idaho last year, including the Rice Ridge, Lolo Peak and Alice Creek Fires. He oversaw a program called Burned Area Emergency Response, or BAER, that addresses problem spots in the first few months after a fire. "BAER really is just that immediate post fire threat," says Brown. "You know, what is the biggest risk? How can we address that in the short timeframe that we have?" It’s kind of like triage. A BAER team assesses every fire bigger than 1,000 acres within the first two weeks after it’s declared contained. The assessment recommends projects that need to be done before fall storms roll through. Funding is limited by the size and severity of that summer’s fires. 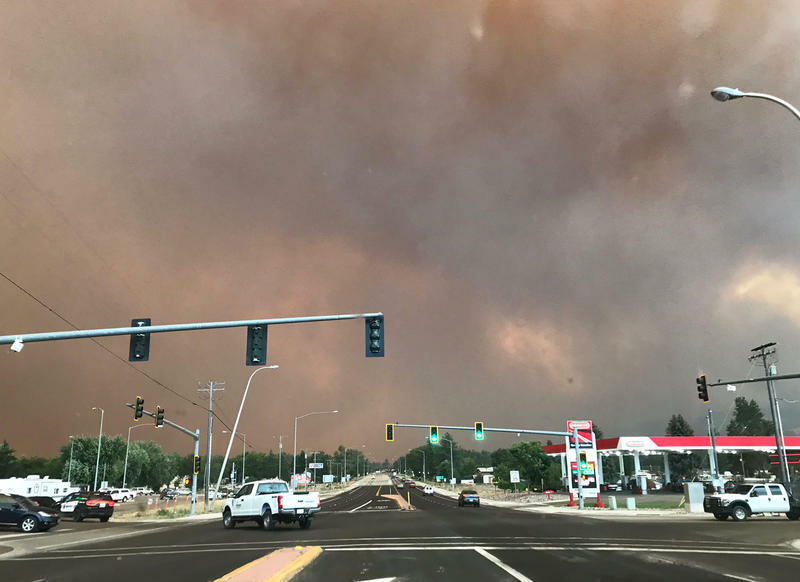 In 2017, three-quarters of a million acres burned in Brown’s territory. His teams completed 22 assessments. Those projects received $4.5 million in funding - that’s about $6 an acre. "So while it seems like a large investment now to go through and do these treatments, in the end, it's preventative maintenance, and it saves us from having to invest a lot more in the repair of those things that will occur," says Brown. Workers for the U.S. Forest Service and the Montana DNRC plant whitebark pine seedlings in the Swan Mountain Range, June 18, 2018. Vince Archer coordinated BAER projects in the Service’s Northern Region. He says BAER projects prioritize protecting human life and safety. They also rehabilitate areas where humans have already made an impact to prevent further degradation. "They’re going to come up with treatments that may be just storm proofing," says Archer. "So improving drainage along the property ways. There may be some treatments for cultural resources where we're looking at just covering them. We'll be doing a noxious weed treatment along vectors, concentrating on trying to contain the spread of the species, rather than the eradication," Archer says. Because funding is limited and prioritization is key, BAER projects only happen on a fraction of the burned forest. The Service typically lets nature run its course or closes areas of the forest to give plants and wildlife time to move back in. But some areas are unlikely to grow back as they were before the fire. That’s the case on a 55 acre patch in the Swan Range that burned in the Squeezer Fire of 2015. "Oh there's planted trees here," says Melissa Jenkins. "They've been here already!" Jenkins is a silviculturist for the Flathead National Forest. She recently oversaw a cooperative project between the Forest Service and the state to replant whitebark pine on this hillside. A newly-planted whitebark pine seedling on the Flathead National Forest. "Before the fire there were whitebark here," says Jenkins. "There were some survivors." Whitebark pine is native to fire-adapted, high-elevation forests in northwest Montana. But the trees have been decimated by a disease called blister rust that humans accidentally introduced from Asia in the 1900s. It’s also losing habitat due to climate change. 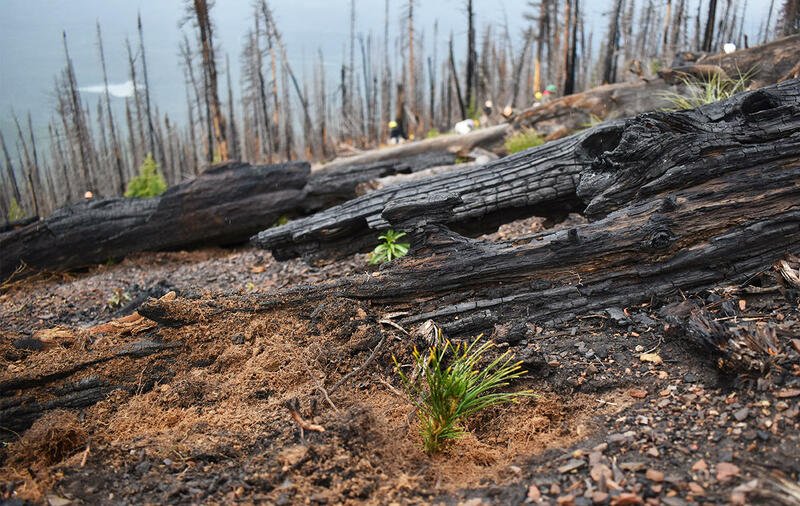 Jenkins says planting whitebark seedlings chosen for their ability to fight off blister rust within the first few seasons after a burn isn’t just good for whitebark. They help restore alpine ecosystems as a whole following fire. "At high elevations we call whitebark a 'nurse tree' because it actually creates a microclimate that is more conducive to other trees to come in," says Jenkins. "So on those harsh sites, it can come in, establish and survive. And then it creates a microclimate where other species of trees and other vegetation can come in and survive, kind of, around it." She picks her way upslope through charred stumps and green huckleberry bushes to check out a stand of adult whitebarks that survived the fire. "You can see that the fire burned right along here and did some damage around the base of the tree, but it's got enough of the tree that is still intact that wasn't affected by fire that it'll do just fine," says Jenkins. Even though they survived the fire, these older whitebarks are past their prime cone-bearing years. They’re also too spread out to be able to repopulate the hillside on their own. It’s possible that without a concerted planting effort, whitebark pines wouldn’t come back in this part of the forest. Jenkins says generally she prefers to wait a few years and see if the trees could make a comeback on their own. It doesn’t seem likely at this site. "This is all blister rust infection," says Jenkins. "This tree is doomed." Jenkins says by day’s end the contracted planting crew will put more than 13,000 seedlings in the ground. Each tiny whitebark costs $2.15. The price reflects collecting them from blister rust resistant trees in the nearby Spotted Bear district and growing them for two years at a nursery in Idaho. At $700 an acre, this project isn’t cheap. But forest ecologist Andrew Larson says this is money well spent. 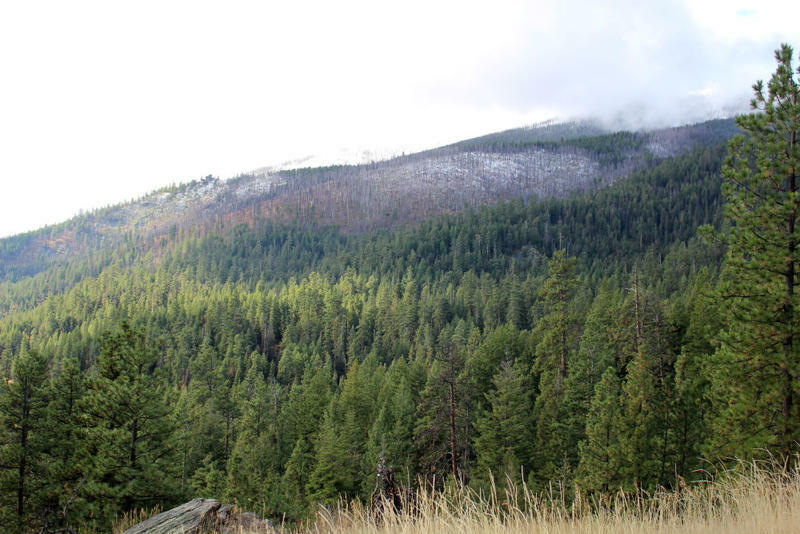 "I think many people may not realize that the subalpine forest landscape there is a shadow of its former self because we've lost this foundation species and that has consequences for a whole host of of vertebrate wildlife species," says Larson. "The loss of that whitebark pine ripples out through multiple trophic levels through the ecosystem." Larson adds that in addition to sheltering other plants and feeding wildlife post-burn, whitebark pines also hold onto snow into late spring, keeping the high country cooler and wetter longer. Not all of the Forest Service’s post-burn projects are about putting plants back on the landscape. The Service also administers commercial morel mushroom harvests and salvage timber logging. Larson says these post-fire responses have ecological guardrails in place and take up a relatively small footprint. "I think it's important for people, to one, recognize that it's primarily an economic activity, not an ecological activity. And two, it's fine," says Larson. "It's something that our society expects of our forests." He says forests are reacting to past management in ways that challenge what we consider normal or healthy. A century of fire suppression let forests inch into what used to be open grassland that served as habitat for elk and other species. He says some patches of forest might be heading in that direction again. "We might have too much forest now, according to some measures and that, especially in light of climate change, we need to expect to have less in the future," says Larson. "Do we want to participate in that or do we just want to be swept along in the current? I think that's a that's a bigger picture issue that we need to grapple with." Larson says the forest is always changing. It’s the human perspective of the forest’s baseline that needs to catch up.